Just after I started hillwalking, I got myself a copy of Ralph Storer's "100 Best Routes on Scottish Mountains". It's been well used over the years, because I found that his assessments of routes - especially when it came to exposure and associated scary bits - fitted pretty closely with my own thoughts on such things. A lot of Munro guidebooks tend to give the impression that unless you're in constant and imminent danger of falling off a knife edge ridge to your severe injury and permanent disfigurement, then there's no exposure worth mentioning. 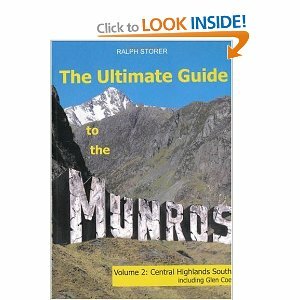 "The Ultimate Guide to the Munros series plans to cover all the Munros... eventually. The speed of writing depends on the ability of the author to re-climb and research alternative routes up the hills, which in turn is heavily reliant on the weather. Volume 3: Central Highlands North, is due out in October 2010. For the others... watch this space." I came across Volume 2, pictured above, last week and given it had Meall nan Eun in it, I took little persuasion to invest in a copy there and then. It's fantastic stuff. I can't recommend it highly enough. I mean, it's amusing, and comprehensive, and it gives two or three different routes up every hill which is commendable in itself, but the real strength if you ask me is that it's a source of reliable information and realistic assessment for your, er, bog standard hillwalker. Your bog standard, risk-averse, exposure-intolerant hillwalker in the case of yours truly. I'm not giving too much away, because I think everyone should go out and buy a copy - even if you've been up all the hills before, I'll take bets there are routes in the book you haven't done - but part of the appeal is the way the book provides differing perspectives on what the hills have in store. The device that's used (rather effectively in my opinion) to achieve this end is that the thing is a joint effort of the...ahem Go-Take-a-Hike Mountaineering Club.
" Ralph Storer President. 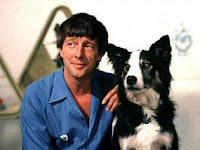 Compiler of routes, penner of words, stopper of bucks, all-round good egg. Gigi Custodian of the Common Sense. Farer (fairer?) of the Ways, arbiter of disputes, friend to all. Named after the two embarrassing grooves caused by too much fence-sitting. F-stop Controller of the Camera. Advisor of the Aperture. Recorder of the Ridiculous. So-named because he's always f***ing stopping to take photographs. Needlepoint Companion of the Compass. Wary Watcher of the Weather. Finds featureless plateaus intimidating, doesn't understand GPS, barely understands a compass. Chilly Willy Keeper of the Cool. AKA Snowballs. Peely-wally, estivates during summer, has never seen a midge, likes his toast crisp and even. Torpedo Expender of the Energy. Bald and streamlined. Loather of laziness. Scorch marks on boots. Ascends as fast as a falling Munro bagger descends. Terminator Raveller of the Rope. Grizzled, monosyllabic, self-taught suicide commando. Hater of the horizontal. Measures his life in scars. Baffies Entertainments Convenor. Allergic to exertion, prone to lassitude, suffers from altitude sickness above 600m, blisters easily, bleeds readily. " "GiGi: Sir Hugh himself was perfectly happy to take an easy way up a mountain if there was one, while A.E. Robertson, widely regarded as the first Munroist certainly avoided crossing Aonach Eagach in 1901(admittedly because of bad weather) when he bagged Meall Dearg as the last Munro on his list." "Terminator: This is a route for expert scramblers only. In places the grade is technically a rock climb.There are no escape routes down into Glencoe between one end of the ridge and the other. Know your capability. This is no place to lose your nerve half-way along. It would not be out of place to carry a rope in case. Fatalities have occurred here. Now go enjoy." "Baffies: I'll drive the car down the glen to save you the walk back up"
Actually, when I said everybody should buy a copy I was maybe understating it. Everybody should, like I intend to do, buy two copies. A pristine housebound one for route planning and general entertainment and reminiscence, and another one that you can cut pages out of, to laminate and take with you on the hill. I hope with that shameless plug for double sales, the author will forgive me for the breaches of copyright on here. Totally agree - great books! Used them the past couple of years. My friend advised ordering an article for the blog here essay writing service uk cuz I write badly. It`s much better when it`s done by professionals. So well-formed text very attracted readers. Thank you for the information provided. It was interesting to read your text. I want to say that in any case, the author has serious experience in this field. Therefore, he created such material. This is a huge amount of work that deserves attention.